coraline is just about to make her grand arrival to the masses! so far the reviews have been very good! rotten tomatoes has it at 88% at the time of this posting. that's quite good! it is weird thinking that very soon all of the hard work that we've done will be unleashed onto the world. whether it is loved, hated, praised or ignored it will be out there. this may be the most important weekend of my life? a bunch of us crew folk practically bought out a theater locally to see the film tomorrow night, and i've made some special preparations! 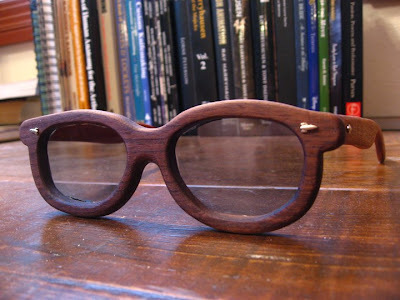 custom rosewood and mohaghany 3D glasses! also, this is pretty funny. AHAHAHA!!! Thanks for sharing that link, Jeremy, that's the funniest thing I've seen since the last Dayjob Orchestra video on You Tube. Jeremy, the movie was amazing. Great job! Color me proud. I saw the movie this afternoon, and loved it. Loved it! I hope you're enjoying a simply *amazing* weekend. thanks kim! i saw it last night with a bunch of crew people and everyone had a blast. -then woke up with a cold and spent the day in bed! THE BEST STOPMO FILM EVER!